Uglyworld #297 - Bringing Cookies To Bed (16/365), originally uploaded by www.bazpics.com. Wage is always happy to hang out with Target whatever they get up to, but his favourite time to hang out with Target is when it comes to bedtime, as he always brings some cookies to bed with him for them all to munch on before they fall asleep. 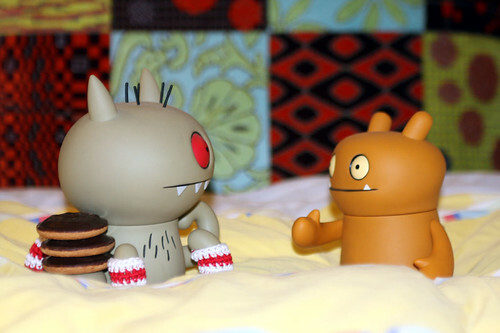 After reading the stories from Wage's adventures in Freiburg the cookie of choice on Target's arm were Jaffa Cakes, which went down a storm with everyone already lying in bed.